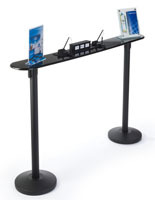 Need to form a line or direct customers? These retractable belt stanchions feature a simple design that will clearly show where patrons need to wait. 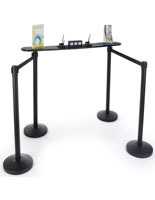 Alternatively, the stands can be used to block off a certain area or to keep onlookers at a distance from exhibits. 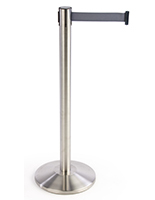 Another feature of the retractable belt stanchions is their highly affordable price. The black and silver fixtures shown here are part of the QueuePole Economy and Deluxe Lines that are made for businesses of any size and any budget. 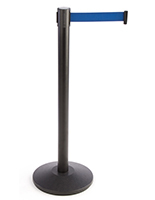 In addition, a number of accessories are offered to fit on these retractable belt stanchions, or queue poles, for extra utility. 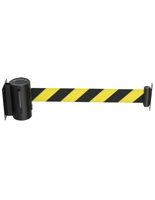 A wide variety of barricades are offered to fit in any environment. 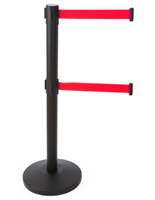 What options are offered with these queue poles? 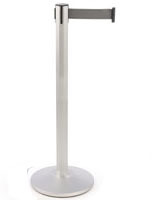 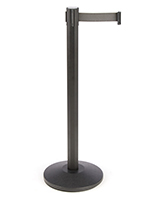 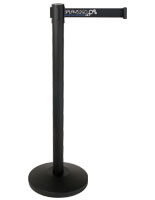 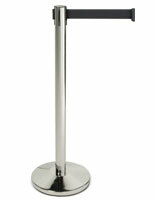 As previously mentioned, retractable belt stanchions are offered in both black and silver finishes. 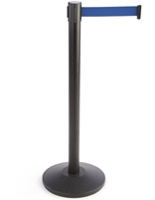 This outer casing is made of durable aluminum or steel that will withstand high traffic environments. 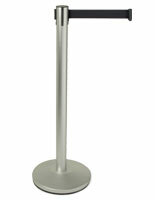 Depending on the make, the crowd control stands can either feature a powder coat, brushed or polished appearance. 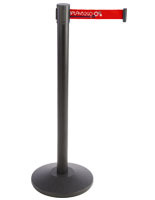 This allows businesses to choose from a number of differently themed queue poles. 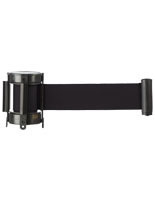 This type of economy retractable belt post is also sold with a number of different colored straps. 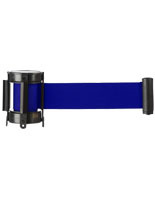 The primary shades here are blue, red, gray and black in the lengths of 6.5' or 9.5'. 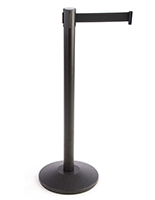 Each of the crowd control fixtures feature a 4-way top that allows them to receive up to 3 other tapes for creating an effective barrier system. 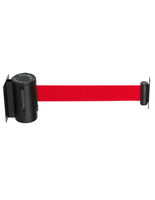 Another option with these queue poles is a custom printed strap, with 1-, 2-, or 3- color imprinting on any of the 4 available shades. 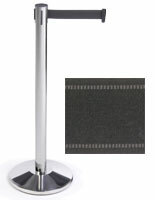 These can be used to advertise a business with its logo in either a single- or double-sided fashion. 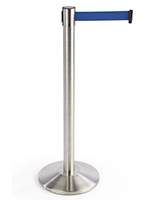 The silk screen printing process is great for any text or graphic. 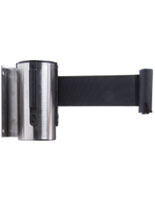 Barrier systems are also sold as wall mounts and are made to be compatible with retractable belt posts found here. 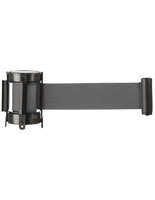 These simple accessories include mounting hardware for easy installation. 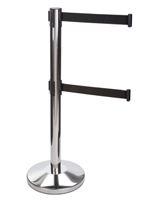 Vertically placed units like these are offered in both black and silver as well. 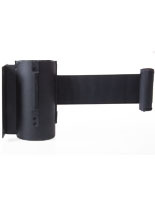 Just as the small wall mounted crowd control accessories are easy to set up, so are the standing retractable belt posts. Simply screw the rod onto the circular base to assemble them. 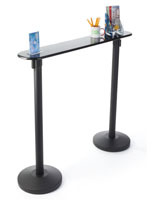 This allows for easier storage and transportation. 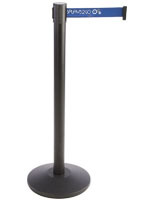 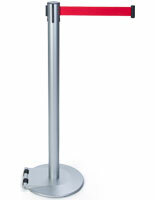 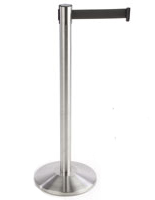 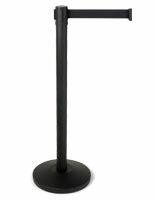 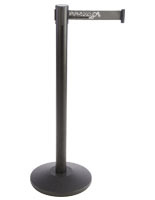 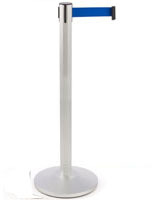 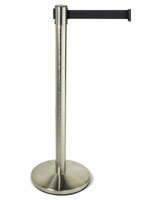 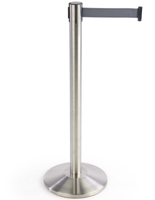 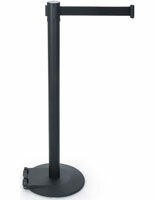 The economy stanchions can be brought to events like trade shows or to other locations where they may be needed more. 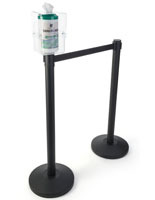 These stanchions are compatible with a number of accessories sold on this site, such as signs, buckets, alternate tops and other straps. 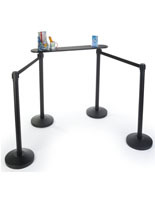 Store owners and event venue managers can use the economy barrier systems for a number of different uses such as starting a line or directing customers to a different area. 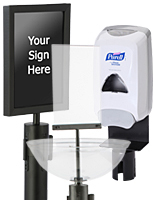 Buckets can be used to sell merchandise or dispense samples while other tops and tapes can be implemented for other styles and themes. 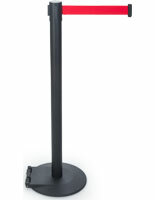 Looking for QueuePole Sign Toppers & Accessories?